March is National Craft Month so what better way to celebrate than to have the very Crafty Chica Kathy Cano-Murillo on the show? Positivity through creativity! What a great way to put it and live it! Kathy is a crazy crafty tornado! Since 1990, she has sold her handmade “Chicano Pop Art” crafts to hundreds of retailers including Bloomingdales, Target, and Hallmark. From 2000-2008, she wrote a weekly syndicated Arizona Republic newspaper column for eight years, and has authored seven books including Crafty Chica’s Art de la Soul andCrafty Chica’s Guide to Artful Sewing. 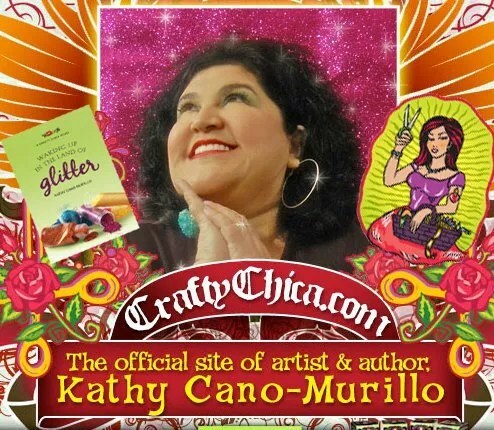 In 2001, Kathy launched CraftyChica.com, a wildly popular web site to inspire women to brighten their lives with clever craft ideas. She had a podcast series on iTunes, a web series on LifetimeTV.com, has been profiled in The New York Times, USA Today and NPR, and now has a Crafty Chica product line. Kathy’s mission is to promote, celebrate and share in the American craft experience. Many of Kathy’s designs show a love for her Mexican-American culture. As a professional crafter, she is impressed that Latinos make up a large part of the $31 billion craft industry. Her goal is to promote and motivate women of all backgrounds, ages and ethnicities to join in the art and craft movement. When she isn’t creating, she writes novels. Her “Crafty Chica Novel” series debuted in March 2010 with Waking Up in the Land of Glitter (Grand Central Publishing). Her next book, Miss Scarlet’s School of Patternless Sewing was released in March, 2011. Plus, as we all know, Marly LOVES audiobooks, and Kathy’s books are also available as audiobooks here! Don’t forget to mention the secret word in your comment below, and Marly will announce the winner on next week’s show! Make sure you remember to shake your snowglobes y’all, and don’t let your glitter settle! Marly has sparkle. So does her podcast that I look forward to hearing each week. Continue to glitter! Today’s show was great! I loved how Kathy works positivity into each and every thing that she does. I think if we all strive to follow in her footsteps then those around us would sparkle with happiness and we could make our little pieces of the world a better place to live. I thought I was tuning into listen about yarn things and got a nice life lesson in the process! Got to love it! You add sparkle to my tuesdays! One day I will remember to listen to the show live, instead of realizing I missed it by two hours. love the shlow today. and sparkle add to life. Crafty Chica definitely has a sparkle personality. Love here creativity. I think a week is plenty of time to enter the contest. Of course this is the first podcast I download and listen to! How could it be otherwise!? I’m afraid I’m not much of a sparkle girl. No glitter or sequins for me. However, I admit to having a huge bead stash, and there’s definitely some sparkle in there! After listening to your show and the Crafty Chica interview, I have decided that there is not enough sparkle in my life! But I am happy and thankful that I found your show to help bring me some extra sparkle! Thanks for all you do! I am so going to add more sparkle to my life. I will start with a knitting retreat this week! Your podcast is definitely an upbeat sparkly part of my day. Thanks for all you do, Marly, to improve our outlook and keep positivity in the podcast. I hope someday I get to listen live! You record at the same time my knitting group meets at a coffee shop so it is a tough choice. Your podcast always adds a bit of sparkle to my life every week and I can’t wait to hear who you talk to next! This was my favorite podcast as of yet. We all need a magical lift now and then and that was it! True story: On my Skype “About” I say …………..”Shinning and sparkling VIBRANTLY” because since as a little girl I loved two things: the sparkle of glitter and lipgloss. Now I still love glitter but yarn is my primary love (bought 4 skeins today………..sssshhhhhhhh…….they were on sale).